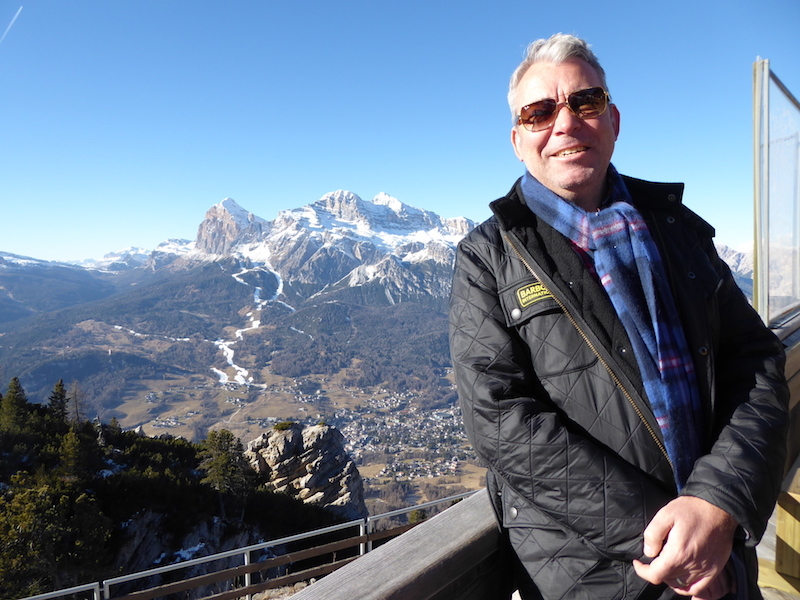 From the moment I set my eyes on the beauty of Cortina, in the Italian alps, it captured my heart. Cortina d'Ampezzo, or Cortina as it's often called, is one of Italy's most charming ski resorts, but there is more to do here other than ski. Defined by a history of visiting Hollywood stars of a bygone era, think Sophia Loren, Brigitte Bardot and Audrey Hepburn, and made famous by the 1956 Winter Olympics the resort had a style, chicness and class all of its own. 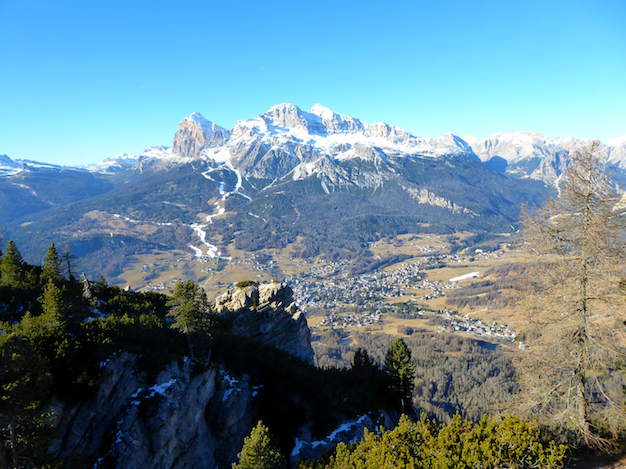 A UNESCO world heritage site this area is perfect for hiking in the summer and exploring the beautiful Dolomite mountains, cute little restaurants, and exclusive fashion stores. 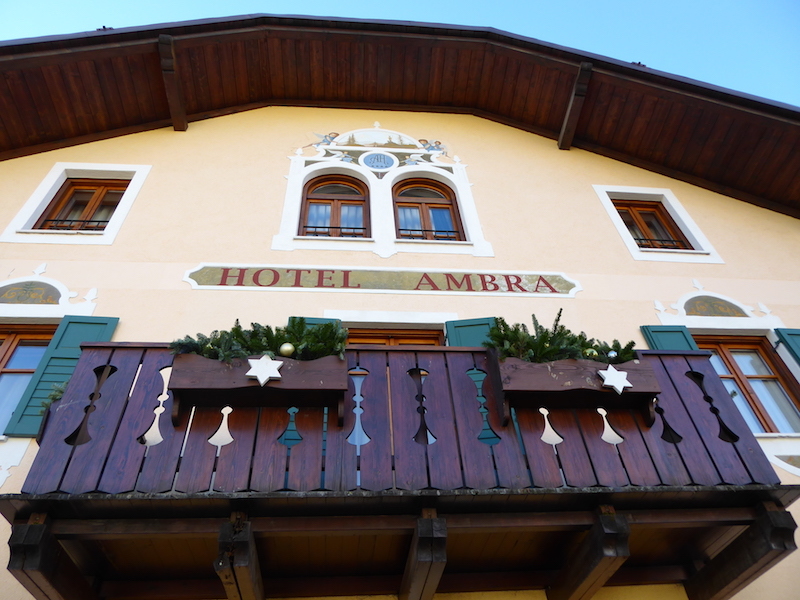 Our base for three days was the fashion boutique Hotel Ambra Cortina. Hotel Ambra Cortina is situated perfectly just behind the main square in Cortina. 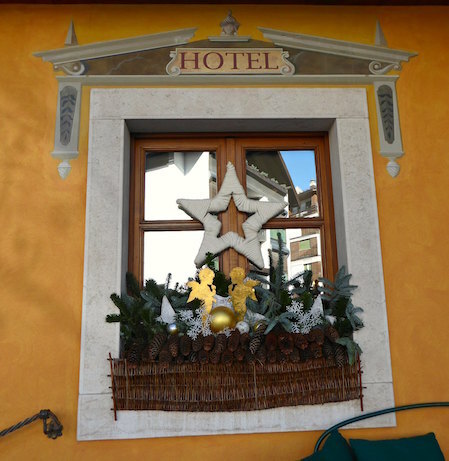 From the outside, the hotel looks like an impeccable Austrian style building, with hard-carved wooden balconies, window boxes and wooden shutters and we were excited to see inside. We were greeted warmly by Elisabetta, the owner of Hotel Ambra Cortina. 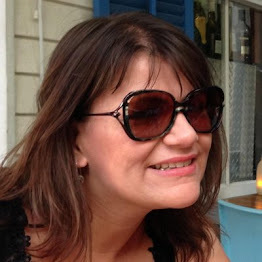 Elizabetta is a third generation hotelier with experience of owning hotels all her life. Born in the Veneto area, ten years ago she took over the hotel. 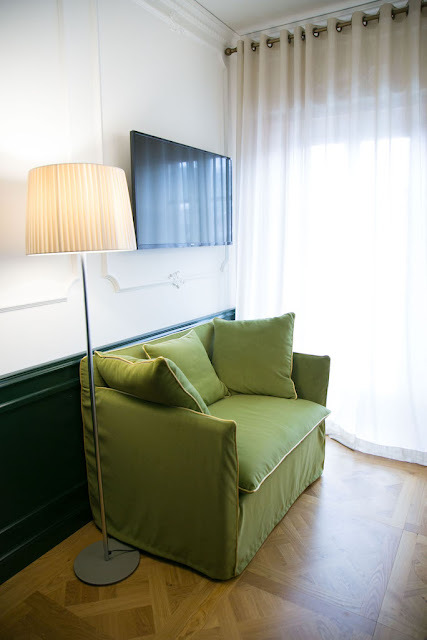 Within the last six months, the hotel has had a complete makeover with the emphasis on a boutique ambience, every room being decorated in a unique way, with the best furnishings, and little luxuries and themed around fashion, cinema, theatre and nature. There is a small lounge with stylish works of art and a small bar area near reception, where the professional and welcoming staff will make you the latest cocktail or a warming hot chocolate or cappuccino. 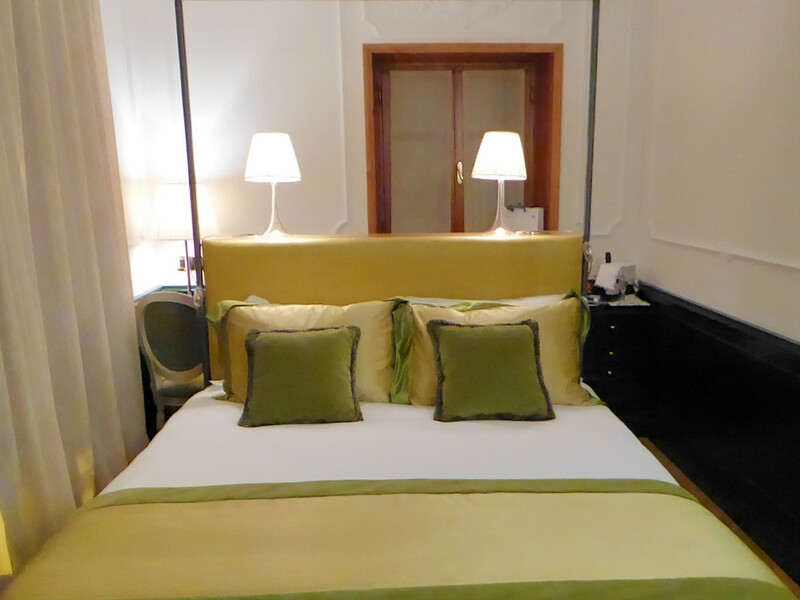 We were shown to our room, which was beautifully presented with a canopy bed and themed around nature in colours of greens and golds. 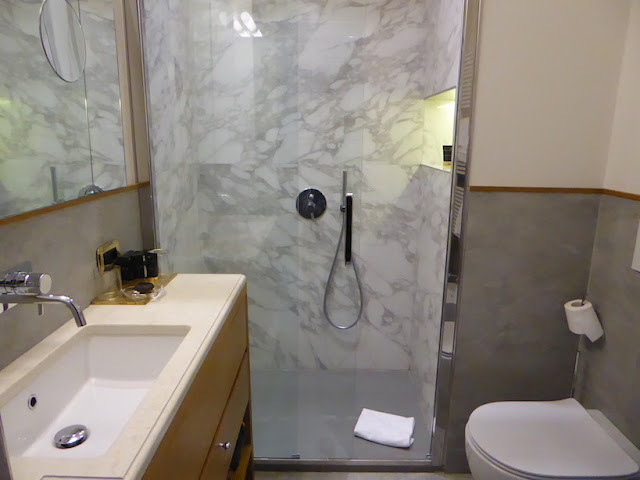 The room had an ensuite marble shower and toilet as well as two seating areas and windows looking out onto the town and the beautiful mountains. The shower had two shower heads, and as Elisabetta had explained earlier this was for 'romance'. 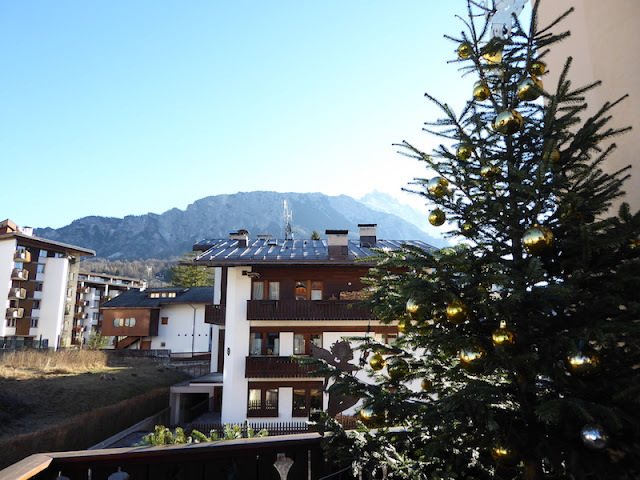 We had a lovely balcony which had our own Christmas tree, which was a beautiful touch, and an area with a table and chairs on which you can sit and enjoy the scenery. 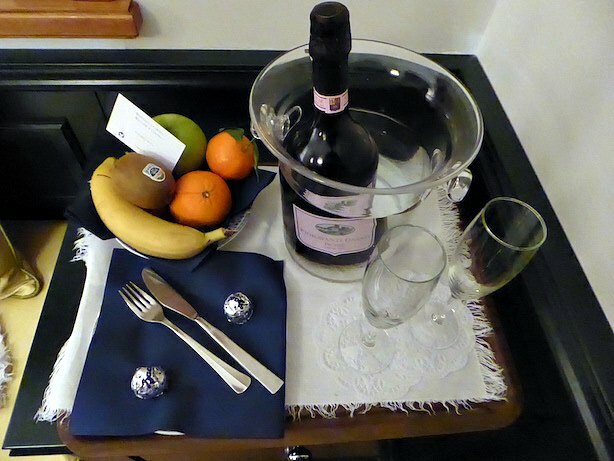 We were greeted with a bottle of sparkling wine and a fruit basket in our room, and these sort of touches make you realise you are in a luxury hotel, as well as the glamorous surroundings of course! 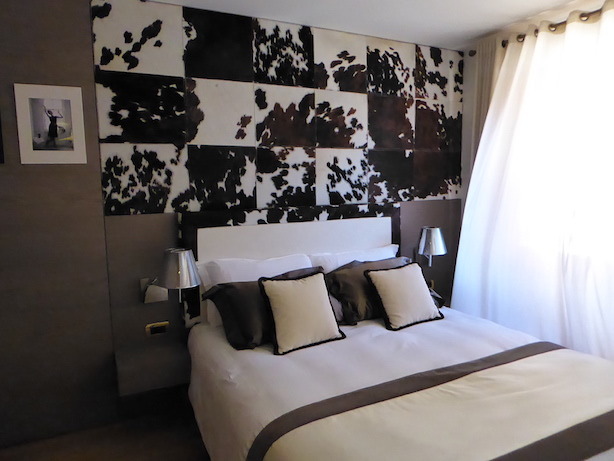 As I was invited to review the hotel with my husband, Elisabetta invited us out that night to a lovely little restaurant called Dok which was almost next door. 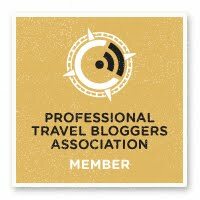 As we chatted over dinner she spoke to us about the hotel, which she described as a fashion boutique hotel. Elisabetta's vision is to sell a dream, somewhere you can visit that is special, romantic, artistic, fashionable, unique. You could see she has a real passion for her work, and a love for her hotel. Being an hotelier is in her soul. That night we slept well, being woken up by the chimes of the local church the next morning. To look through the windows and see the beauty of Cortina was the perfect start to our day. Breakfast was served in a traditionally styled Tirolean breakfast room. 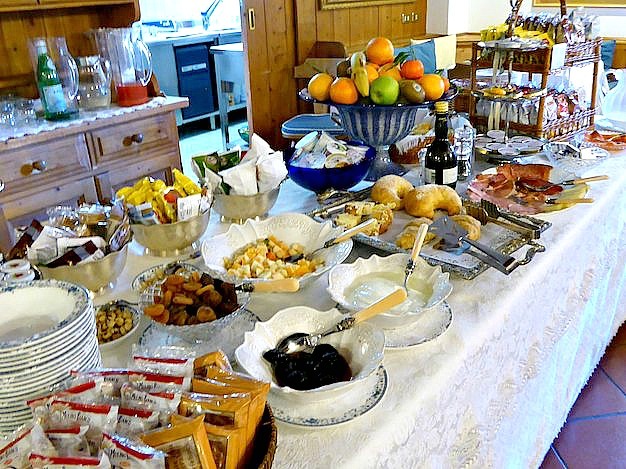 The breakfast was ample with a choice of pastries, fresh fruit, yoghurts, cured meats cheeses and cereals with egg dishes made to order. One day we even had chocolate cake, so if you wanted to indulge in that for breakfast then why not, you are on holiday after all? After breakfast, Elisabetta showed us around the hotel. 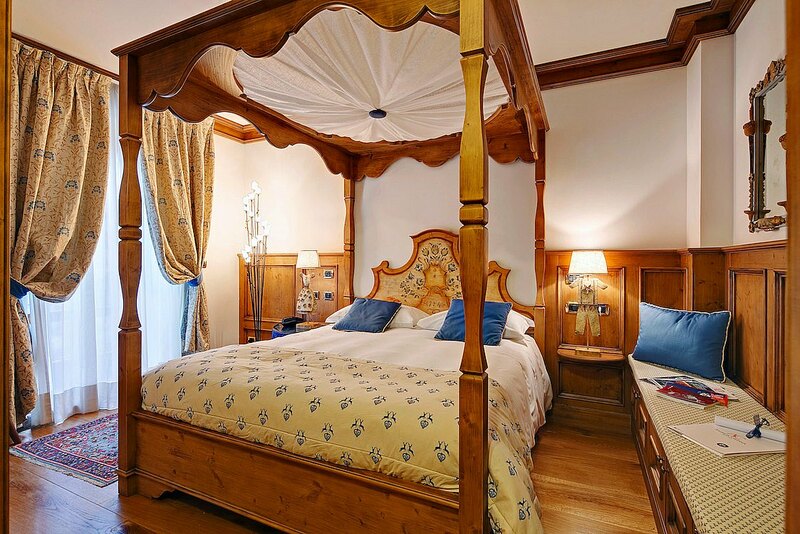 The 24 individually styled rooms are all subtly themed, think amazing furnishings, fresco paintings, and hand wood carvings. 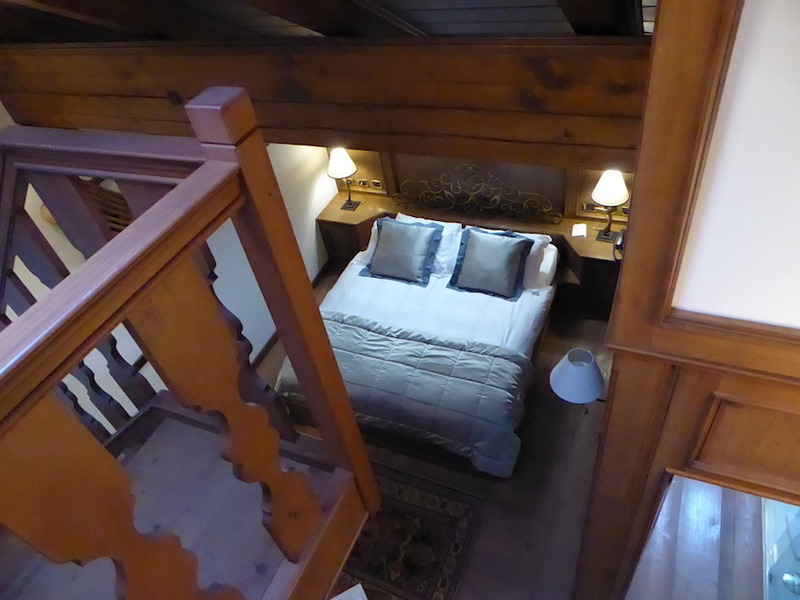 The 5 luxury roof rooms are designed with antiques and furnishings by local artisans. The 11 superior rooms are classified as 'emotion' and 'relax' rooms with canopy beds, with a double shower or double airpool bath and balcony. 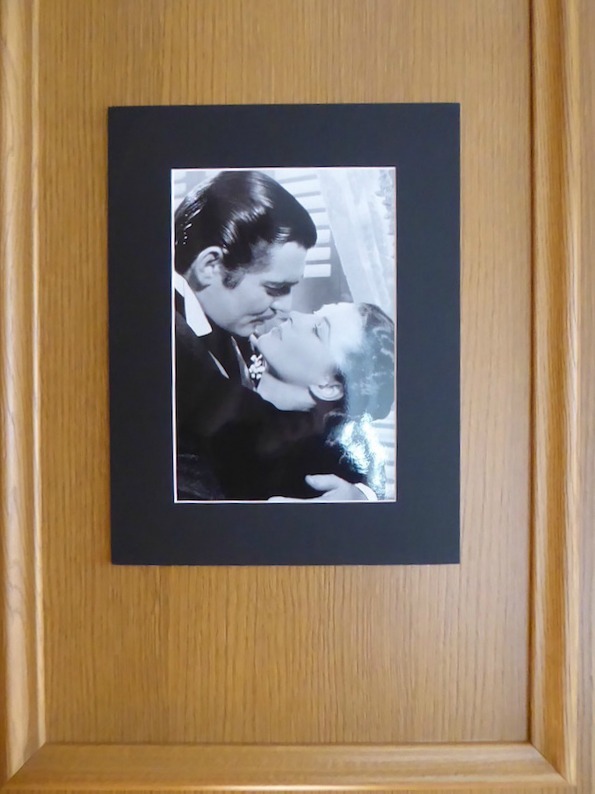 The 8 classic rooms are divided into themes of 'cinema'. 'fashion', 'nature' and 'theatre' . 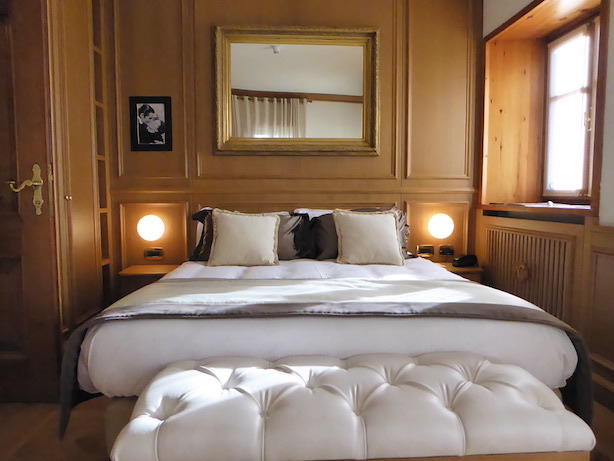 I will let the photos do the talking here as I cannot simply describe how gorgeous each room was. 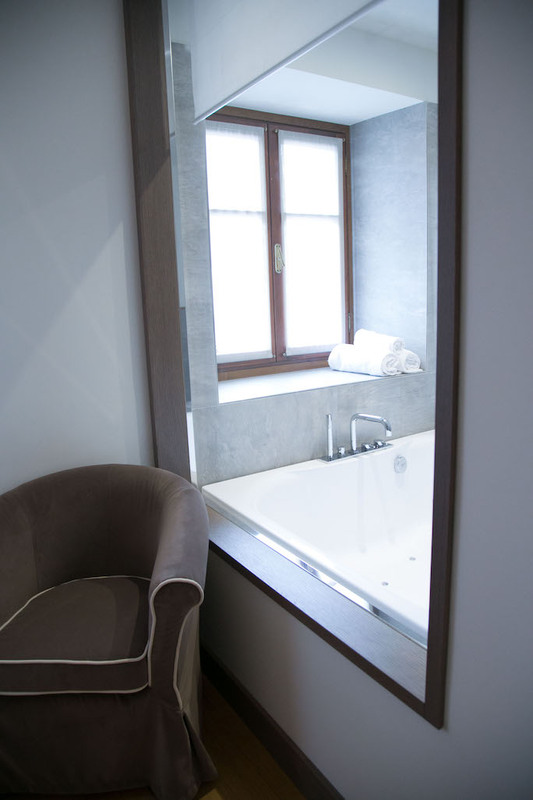 An interesting feature in some of the rooms is the window in the bath and shower area, designed for couples to add some spice to their love life. However, you can adjust the blind if you don't want everything on show. With every room, you get the use of bathrobe and slippers, luxury toiletries and a vanity set, minibar, high-speed wi-fi and a personal safe. 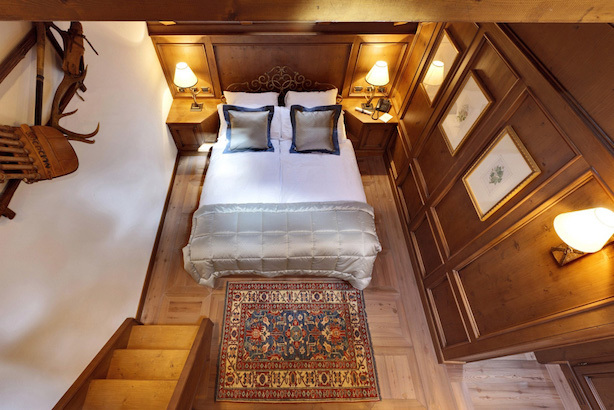 Individual rooms have marbled bathrooms, classic wooden flooring, stone cladding, and intricate wood panelling. Every room is different in its own way, super stylish, incredibly chic. 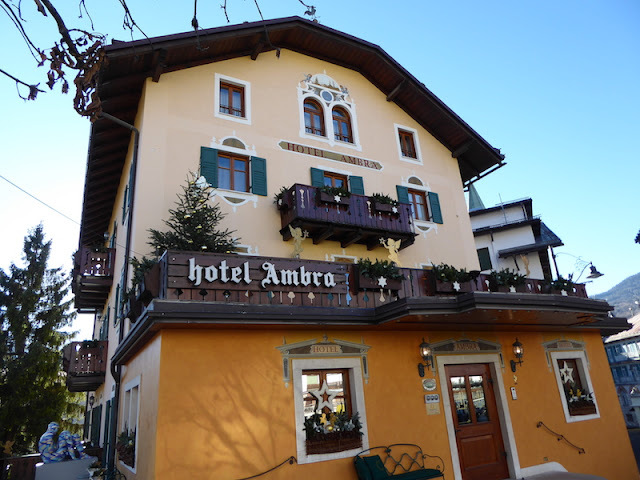 Hotel Ambra Cortina is a perfect hotel for a romantic stay with your loved one, and Cortina is a place where you can relax and enjoy the gorgeous fresh air and alpine scenery. 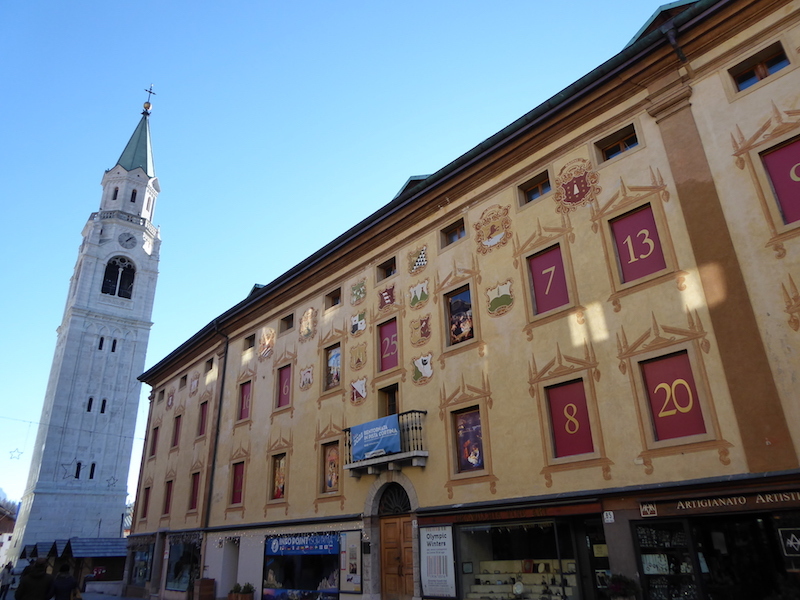 To read and see more of this beautiful alpine region check out our article A Weekend In Cortina D'Ampezzo, on our dedicated travel blog Fly Drive Explore. 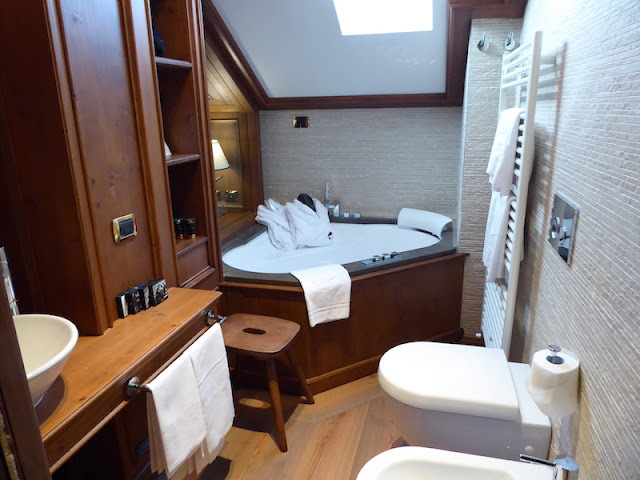 To give you a better taste of the hotel here is a video Mr W made to show you the stylish rooms. As Audrey Hepburn said “I believe, every day, you should have at least one exquisite moment. 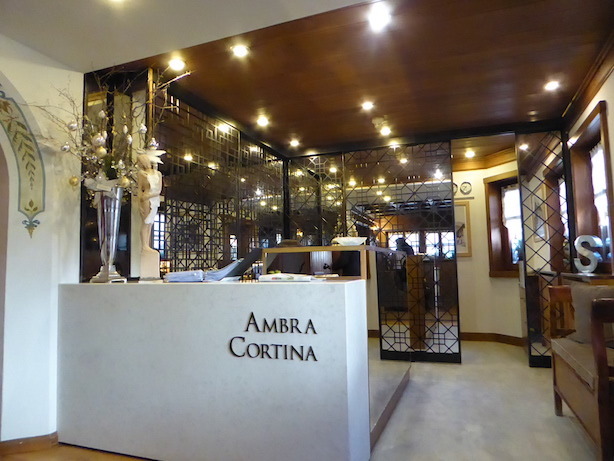 “ If you are staying at Hotel Ambra Cortina all your exquisite moments will come at once. What a charming, quaint place to stay. It sure does look cozy. What an utterly charming hotel! I'd love to visit the Dolomites one day. It is such a gorgeous hotel. I don't think the photos do it justice. Hope you get the chance to visit this area one day. Wow! this place looks amazing and so pretty, my dad is an avid skier so I am gonna show him this as its somewhere he hasn't visited. I just saw Cortina in the second Bridget Jones film! 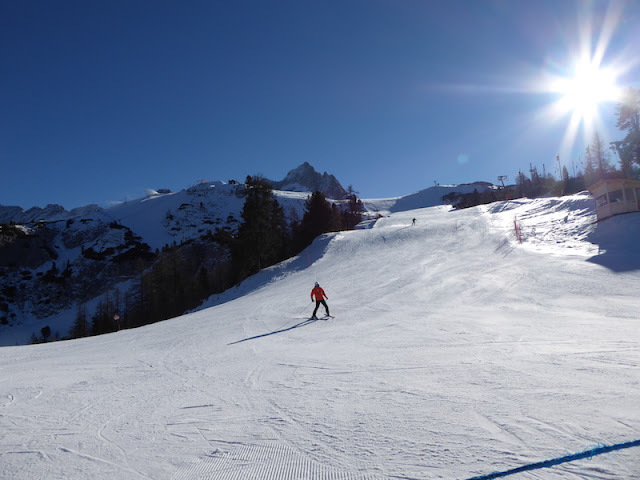 It is a really lovely place and an excellent ski resort in season. Oh wow! What a cool place. I would never guess that the inside would be so posh with that rustic exterior. I love it. The owner spent time and money lovingly making the rooms unique and furnishing it to a high standard earlier this year. That hotel is absolutely gorgeous. I love that old school vibe of the exterior coupled with that cozy, super posh atmosphere on the inside. This hotel is absolutely stunning and all of the rooms are so gorgeous and luxurious. I would so love to stay there, and what beautiful views too! We really did and were so lucky to stay here. It was just perfect. What an wonderful place to stay and that view is amazing. I would love to take a trip to Italy one day! It's true those little extra touches can really make a difference. It looks like a lovely hotel to visit. They make the stay feel extra special. What a gorgeous hotel! It seems to offer the perfect blend of charm and elegance. Your photos have me really wanting to stay in this hotel. I love seeing all the themed rooms, and those tubs! Relaxation at its finest. The theming is just so chic. The owner has wonderful taste as you can see. I love that view! I miss the mountains! Wow1 That is one gorgeous place! I would love to take the family there for a visit. Hope you get the chance to go one day. Wow, what a beautiful place to stay. It looks perfect for a couple's getaway. Talk about luxury! This is one place I would love to stay when I visit Italy. 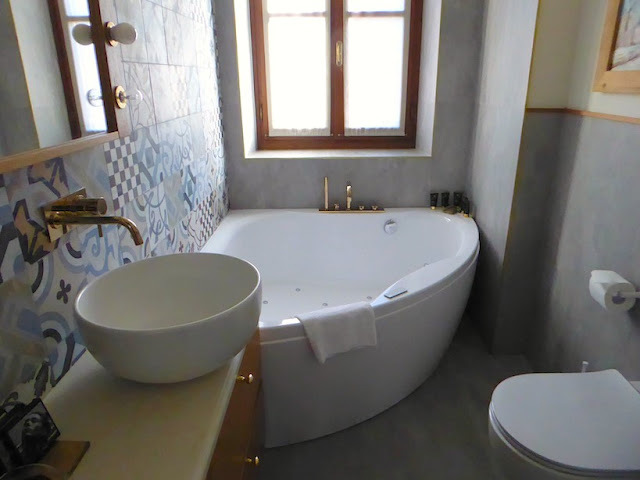 The rooms, those beds and the bath. OMG. I wish I could just live there. The inside has had a complete makeover using only the finest furnishings, but the outside is really pretty too, as you say just more rustic. What a lovely hotel, the decor is amazing as is the four poster bed. I have always wanted to go to Italy and this quaint hotel reminds me of a yearning for the olden days. Ana you should go to Italy, it is a beautiful country, we both adore it. What a lovely place! Adding this to our bucket list! 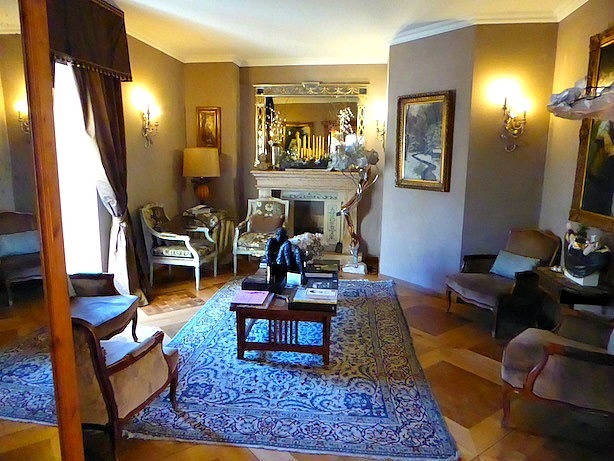 It is a very charming hotel and exceptionally beautiful inside. That is a great saying about each day. You have a terrific set of photos in this article. Thank you that is very kind of you to say so. The whole place looks very beautiful. Cortina must have been one of the long-lost treasured places of nature because I can see the beauty of life everywhere there. The natural beauty of this area is outstanding. I've always wanted to go to Italy. What a beautiful place and that's only one spot! I am sure you all had such a glorious time. How could you not at such a beautiful place?! Oh my goodness, this is like a dream vacation for me. How magnificent! This is such a beautiful place to stay. I would love to visit here myself. What a beautiful hotel!!! It has a really gorgeous feel to it! Lucky you! Yep we both felt very lucky, almost had to pinch ourselves. What a really quaint and beautiful, so very traditional. The hotel looks so chic and cozy and the view are absolutely amazing! It was incredibly chic inside! Awww... this place looks adorable. I'd love to visit Cortina one day. 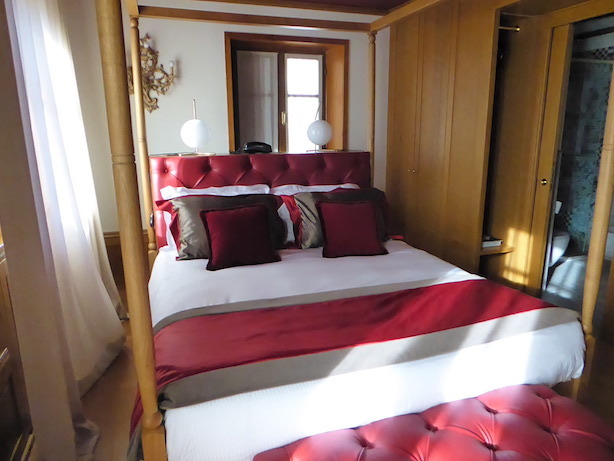 Elizabeth, the hotel was utterly gorgeous and Cortina is such a pretty little town. Highly recommended.